InnerSiege are a five-piece metal band from Illinois. Three of their members were formerly from a band called Strangland. Their style is often described as power metal, with comparisons to Kamelot, Firewind and the like. While a band like Kamelot may be one of their influences, it certainly doesn't define their sound, at least not competeley. When I think of that ilk of bands, I tend to think of keyboard-driven, dungeons and dragons-type Euro power metal. That certainly does not describe InnerSiege. Rather, they are guitar driven, American heavy metal. If I were to compare them to any European power metal bands it would be more along the lines of Dream Evil or Primal Fear. My initial thoughts were that their sound has more in common with bands like Lethal, Armored Saint, Recon, and early Fates Warning. All the elements of a heavy metal classic are in place; soaring vocals, memorable songs, crushing guitar riffs, sweeping guitar leads and a near perfect mix. "Kingdom of Shadows" was mixed and mastered by Fredrik Nordstrom (Dream Evil, In Flames, Opeth). Vocalist Jeremy Ray most certainly studied at the Geoff Tate school of heavy metal vocals, though his tone and phrasing isn't a clone of Sir Tate. He gives a high-caliber performance that is all his own, hitting the highs, but mostly singing in a pleasing mid-range voice. Having seen guitarist Kevin Grose perform live with Strangeland, I had no doubt about his skills to burn up a fretboard. Indeed he proves his ability here with some speedy licks to spice up the songs, as does guitarist J.L Prater. Most of the songs here are of the mid-paced variety. The album opens with the strong "Warrior", a song that is driven by a crunchy riff. In the first thirty-five seconds of the song, Prater and/or Grose unleash some jaw-dropping lead work before Ray's smooth vocals kick in. "Fight On" picks up the tempo slightly with a slightly more upbeat rhythm section and another crunchy guitar riff. "Dragon Rider" is one of the songs that stuck out immediately upon the first listen. The song gallops along with a classic metal feel that is sure to bring a smile to the face of most denim and leather clad metal fans. "What Kind of Love" is a short, melodic instrumental that acts as an intro to album closer "Ultimate Sacrifice". "Abuser" is an upbeat, biting song with lyrics that deal wit the nastiness of sexual abuse. Some songs touch on spiritual and even Christian themes. "Ultimate Sacrifice", for example, seems to compare the sacrifice of soldiers since the 9/11 attack on the US to the ultimate sacrifice of the Son of God on the cross. 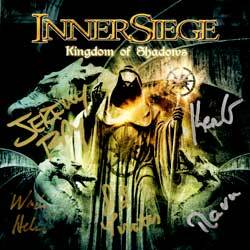 However, I am hesitant to call InnerSiege a Christian band, rather they are a metal band with some well-written and spiritually-based lyrics. "Kingdom of Shadows" is a very strong debut from InnerSiege and definitely one of the best releases to come from the independent Roxx Records. Pre-ordered copies of this album came with an autographed cover insert.